A picture is worth a thousand words. Quality imagery is critical in the successful marketing of any landscape firm. It is an essential building block of any company’s brand identity. NOTHING sells a landscape project quite like pictures. Website stats for our landscaper clients consistently show that the most visited pages are their photo galleries. Your prospects are spending most of their time looking at your pictures. Work like Bob the Builder, present like Martha Stewart! When it comes to showing your company’s work, it’s not enough to record the fact that your company built something. If your images aren’t inspiring consumers with stories about the experiences your products will deliver, you’re missing your biggest opportunity. Which of these photos tell a more inspiring story? Autumn is a great photo op. 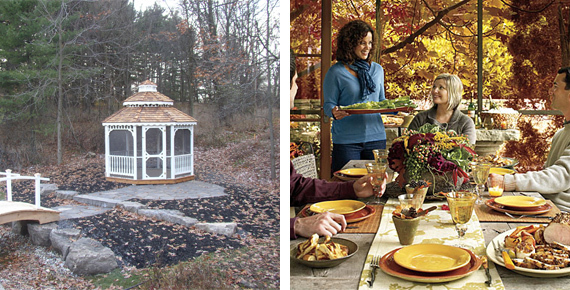 Many landscape firms and builders’ portfolios only present their work in a summer setting. The lush green lawns and sunny pool areas are inviting, but they leave the impression that they can only be enjoyed for about two months of the year. Fall images can be equally gorgeous and remind homeowners that they’ll maximize the value of their investment by enjoying their property into the fall and spring seasons too. Putting your work in the best light. Fall offers many storytelling opportunities with beautiful colours, textures, and light quality. It’s a forgiving time of year for the landscape photographer – the one time when strewn leaves and dried plants actually add charm and beauty – a kind of rustic ambience. If you do plan to shoot some of your completed projects this coming week, try boosting the emotional quotient with lit candles and warm lighting, table settings and seasonal items like pumpkins, corn stalks and fallen leaves. 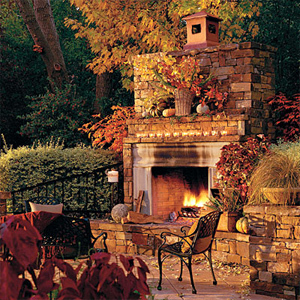 You’ll be reminding your customers to light a cozy fire, serve warm drinks or a rustic outdoor meal among the fall garden colours while catching the last rays of the setting sun. A WORD OF CAUTION: everything communicates. The quality of your images will also reflect the level of professionalism of your company. Be objective about the skills of your photographer. Ask a professional for help. If you’re located in Southern Ontario this may be the last week to capture some great portfolio pictures. Give us a call (289.656.1444) in the next week to book a photo shoot before the colours disappear, or to schedule a shoot for each of the seasons in 2011.